The name J.D. Kinnear figures prominently in the shooting death of Bud Philpot near Drew’s Station, as Philpot was in the employ of Kinnear the night he died. And an early account by a passenger of Kinnear’s offered some insights to him. He allowed three travelers “representing the Celestial Empire” (referring to the Chinese passengers-a view that to some Chinese seemed a bit out of this world) to ride for free as long as they agreed to walk alongside the coach as it traveled up long hills as his mules struggled to pull the coach. And Kinnear toyed a bit with passengers fearful of Apaches who had already been removed from the area by government relocation. “Our leader, Mr. Kin[n]ear, was a perfect overland traveler. He would awaken us by singing in low, soft notes, ‘Three O’clock and all is well,’ repeating this until all were awakened and upon their feet ready for fight or flight.” That Kinnear would awaken his passengers to let them know they were still alive led the gullible to believe that “Had it not been for his intrepidity and coolness we would perhaps have never gotten through the perilous mountains, passes and canyons, as there were and are about five hundred of Uncle Samuel’s red wards off from their reservations hovering over the route we traveled.” Though the Chiricahua Apaches were nowhere near this route during this journey, Kinnear at best did little to dissuade his traveler’s fears with the truth, and at worst may well have been the source that “five hundred” were hovering over the route. What is clear is that if the Apache’s been in the area (which they were not) at that time, had they wished to attack Kinnear’s stage, there’s little that he could have done in the face of such powerful opponents, except run. Despite such early antics, Kinnear soon made himself an early player in Tombstone’s development. 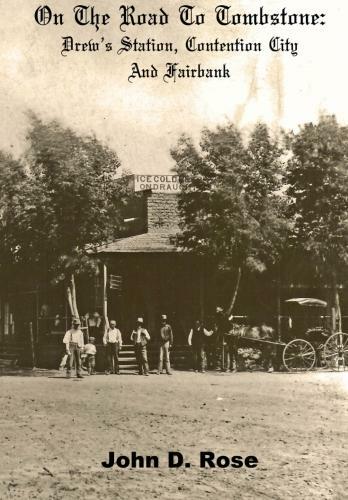 By offering reliable stage travel from Tucson to Tombstone, Kinnear was a key part of the progress and growth of the fledgling mining camp. Arriving in Tucson in October of 1878, Kinnear would soon visit Tombstone and see the opportunities. He would soon have a ticket office in the Cosmopolitan and Palace Hotels, both in Tucson, the latter being managed for a time by Charles Shibell, who once hired Wyatt Earp as a deputy. The Southern Pacific RR wouldn’t arrive to create Benson Arizona until June 1880, so reliable Stage Coach travel from Tucson to Tombstone was imperative. Even after SP tracked as far East as Benson, Stage travel from Tombstone to the Railhead at Benson remained necessary as Tombstone would not have it’s one line to town until after 1900. As the Tombstone Mines poured forth their riches, new arrivals, miners, shopkeepers, drummers,(aka, salesman) families and all who hoped Tombstone would turn her riches to them all had one thing in common…they had to get there in the first place. Kinnear would begin regular service to Tombstone in November of 1878, and a year later another arrival, this one from Kansas, had the same idea, though a bit late to the boom. “I intended to start a stage line when I first started out from Dodge City, but when I got there I found there was two stage lines and so I finally sold my outfit to one of the companies, to a man named Kinnear. But I intended to start this stage line when I went there” as Wyatt Earp later recalled. That Wyatt sold out to Kinnear proved to be a wise move. Kinnear aggressively put early stage line rival Andrew J. Cadwell out business, and later battled former employee H.C. Walker who had left his employ to form a competing line with his new partner William “Billy” Ohrnesorgen. When a stage coach belonging to the Walker line fell victim to a crash induced by the secret loosening of a critical hub nut, press suspicion focused on Kinnear, given other slights that had also taken place. Though Wyatt Earp is remembered for not backing down in the face of danger, backing out of competing with Kinnear and other Stage operators may well have spared him a significant business loss. The Ash spring site was located near the northern edge of the Whetstone Mountains. It was a thrill to discover the location of this very important site. As these photos show, little remains on the ground from Kinnear’s time here, as the tank and cement troughs seen are mid 20th Century uses of the much older site. Clearly the water source which Kinnear once used is what has drawn more recent users to the area. In researching the site I am happy to share the photos below of the artifacts which were found at the Kinnear site, which date to the 1880’s and into the 20th Century, confirming that water in the desert will always attract history across time. The Kinnear site is on private property. The Earp/Flood map depicting the killing of Curly Bill Brocius shows the Kinnear Stage Station location, which you see a portion of below. A red star has been added to the left of Kinnear's to make it easy to find. An ad from the Tombstone Daily Nugget, December 20th 1881. The Palace was an early office for J. D. Kinnear (see photo of the Palace Hotel) serving his passengers heading from Tucson to Tombstone. Note that it is under the management of Charles Shibell, whom Wyatt Earp worked for early in his Arizona career, and that in 1881 the Palace had telephone service. Original Nugget courtesy of the collections of John D. Rose. partnership, and Walker would later partner with of all people, J.D. Kinnear. Original 1879 Tucson Daily Citizen from the collections of John D. Rose. commonly known as the Butterfield. He would soon partner with H.C.
Walker and compete head to head with Walker's former boss, J.D. Kinnear. Image from original Tucson Daily Citizen in the Collections of John D. Rose. This is H. C. Walker's sign on Allen Street in Tombstone, located between the Cosmopolitan Hotel on the right, and the original Brown's Hotel on the left. Walker was a key competitor of J.D. Kinnear's, though they would later become partners. Though the awning post obscures a portion of Walker's sign, it's clear that this sign communicates that this is his office for his Mail and Stage line. This close up is from the original stereoview which was taken in the April/May 1880 time frame. From the collections of John D. Rose. This is from the upper portion of H.C. Walker's letterhead while he was very much in heated competition with J.D. Kinnear. This letter was written by Andy Mehan, and is very revealing as to the early machinations and financial chicanery that went on early in Tombstone as businesses vied with each other for outside capital, as well as local backdoor business dealings. Andy "A.J." Mehan of the Capitol Saloon, testified at the Spicer Hearing, bringing into the court room the gun he claimed had belonged to the then deceased Tom McLaury, having left it with Mehan prior to the gunfight near the O.K. Corral. Original letters from Tombstone which relate to Stage Coach travel are highly prized by collectors, and more so if handwritten by a witness at the Spicer Hearing. Courtesy of the collections of John D. Rose. The arrival of Southern Pacific (S.P.) meant that stage operators such as Kinnear and Walker would have to shorten their routes to remain in business, as their Stage Routes thrived until the RR arrived. Once S.P. tracked to Benson, the remaining competition between Stage companies would now take place on the route from Benson to Tombstone, as the Tucson to Benson leg was now dominated by S.P. RR. The original S.P. Depot for Benson is no longer downtown, though locals claim it's a home located now in the countryside. This wax sealer is the original from the Benson S.P. office. Sealed envelopes with wax were a common business tool in the 19th Century. Whereas a given office might print a thousand letterheads or envelopes at a time, they would normally, due to the expense, only have one wax sealer made, thus the scarcity of them in general. John Rose leans against a 20th Century water tank at the Kinnear site, showing continued use long after Kinnear and his Stage Coaches had moved on. Other views of the Kinnear site. A more contemporary spring box from the 20th Century, but likely useing the very same water source that first attracted Kinnear and his thirsty passengers in the early 1880's. More remains of 20th Century use of the Kinnear site. This cocoa tin was discovered at the Kinnear site and dates to the 1882/1883 time frame. Some artifacts at the site date to the Kinnear period, some after. Dinner at Kinnear's anyone? This spoon was discovered at the Kinnear site by John Rose . Click book cover below to order a copy.